Returns this April 28th to Distant Cellars. Enjoy a three-course luncheon pairing with re-nouned Chefs. 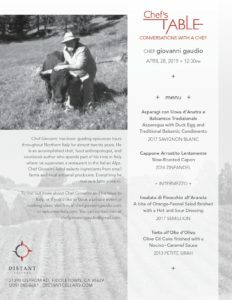 APRIL 28TH CHEF GIOVANNI GAUDIO IS BACK FROM ITALY AND READY TO SERVE YOU AN AUTHENTIC ITALIAN LUNCHEON.